A couple of weeks ago I was playing a Hooters Tour event in Amelia Island in Florida. The tournament finished on Sunday and as we were so close we decided to make the quick drive down to the TPC at Sawgrass practice there on Monday. Although Sawgrass is a public facility (for those willing to pony up a mere $400) we were fortunate to have access to Sawgrass in a way that only a rare few have. I say we because my roommate I live with in Atlanta is David Skinns, an Englishman who plays on the Nationwide Tour. Being a member of the PGA or Nationwide Tours allows a player total access to any of the 29 TPC layouts throughout the continental US. And so, on a sunny Monday morning in March we drove into the Sawgrass parking lot in my dinged-up 2000 Mitsubishi Mirage with 213,000 miles on it and parked in the â€œplayer parkingâ€ section so close to the font door we might as well have been inside the club house. We were greeted in the pro shop by head professional Matt Borocz, who graciously showed us around the facilities, giving us a guided tour of the practice areas, clubhouse and closing holes on both nines. He then headed inside and returned with Titleist range balls and showed us to the back of the range where we were to warm up before our round. The TPC at Sawgrass has a large practice range, and extensive greens for chipping and putting right next to the Spanish-inspired clubhouse, but we were not going to be using those facilities. No, the VJ Singhâ€™s and Jim Furykâ€™s that practice at Sawgrass have their own area and thatâ€™s where we were warming up. The professionalâ€™s practice area is a sanctuary. Tucked away in the back corner of the range are two massive teeing grounds (one rumored to have been built just for VJ), a phenomenally large and undulating putting green that was running about 12 on the stimpmeter, and three chipping greens all in perfect condition. As we drove to the back of the range we could already see somebody back there. We had hoped that it was VJ himself, pounding ball after ball into the morning sun, but alas, it was only PGA Tour player Kevin Stadler. I hoped he didnâ€™t see the disappointment on my face as I walked past him to warm up. We warmed up and struck a few putts before Matt returned and told us that if we wanted to jump off the front nine immediately we would have the course to ourselves. And he wasnâ€™t kidding. We hit off the 1st and never saw another player, barely even a maintenance worker, the entire time we were out there. To keep things interesting we had decided to put $10 on the outcome of the day, and as we turned to the back nine I had a one shot lead with an even par 36. We were playing from the absolute tips as well, ignoring the tee markers and walking to the extreme back of every teeing ground. As we got deeper into the back nine, the holes, so memorable on TV, were becoming more and more familiar. On almost every hole there were small flags placed where plaques had been laid down to commemorate famous shots from The Playersâ€˜ champions like David Love III, Fred Couples and Hal Sutton, and we were now treading the same grounds as those legends. As any golf fan knows the final three holes at Sawgrass are three of the most charismatic and dramatic finishing holes anywhere in the world. The drama and excitement of The Players comes down to the risk-reward par 5 16th, the iconic and dangerous par 3 17th and the merciless par 4 18th. We came to the 16th tee all square in our match. Ordinarily the 16th is a pretty reachable par 5 for professionals such as ourselves, but today, with temperatures on the cold side, we would not have the opportunity to go at the green in two. There is a large fairway bunker on the right hand side of the hole and this is where my ball ended up. Davidâ€™s was in the left rough. Down the left hand side of 16 is a large tree which blocks out a safe lay-up down, which is the safe side to play if you want to avoid the water which hugs the right hand side of the fairway and cuts in behind the green. Showing a distinct lack of local knowledge we both laid up too far down the left side and were blocked out by the tree. I was slightly further back and elected to go over the tree with a 60 degree wedge. however, in avoiding the tree I couldnâ€™t get the ball to the back of the green where the hole was cut. David got creative with his shot, punching one under theÂ branches and scurrying his ball up to the middle of the green where my ball sat. I putted up and tapped in for par and waited for David to putt, gazing back across the pond, past the tree island in the middle of the water, towards the most intimidating hole on the PGA Tour. David putted out for par to keep the match all square and we drove over to the 17th just as a tour bus full of visitors pulled up behind the tee. We had a gallery for our match at last. I assume they were after blood. Not actual blood of course, but metaphorical, golfing blood. They type of blood that they see on Sunday at the Players when Sean Oâ€™Hair dunked his ball into the water while trying to chase down Phil Mickelson. Or when Bob Tway, four shots off the lead and making a charge, airmailed the green not once, but twice on his way to making a 12. Yeah, thatâ€™s what they were after. It wasnâ€™t 25,000 screaming fans on a Sunday at The Players, but this tour bus sure felt like something similar to us. Most of the back portion of the tee was roped off to protect the grass for the tournament which was still two months away, but there was still a small section at the back of the tee pros could hit off. Thatâ€™s where we teed off. The hole was cut on the front slope of the green, making the shot a lot shorter than it would normally play. However, from the tee it looked like the pin was sitting about 6 feet out into the water. It was intimidating to say the least. We paced off the yardage and figured it to be 132 yards with the breeze helping a little from the left. Dave took a deep breath and hit first, his ball looked like it was going to be short the whole way, but the wind carried it all the way to the front of the green, pitching half way up the slope, taking one bounce forward before backing up to 6 feet from the hole. It was a hell of a shot and he drew enthusiastic applause from our audience. I was next. Ordinarily, 132 yards is a very little nine iron for me, but with the wind helping I decided to try and jump on a wedge and take my chances. I tried as hard as I could to go through my routine, and struck the ball very, very well. The ball jumped off the club and my first impression was that I had hit it too far. Half way across the water the wind knocked it down a little and I thought it had to be wet. Then, as if according to plan, it landed just past the hole, took one bounce forward, spun, and began trickling back down the slope towards the hole. Iâ€™m pretty sure I wasnâ€™t breathing as I saw the ball track back towards what had to be a hole in one. Iâ€™m still not sure how it missed, but it did. It ended up 4 feet below the hole. As we drove around the pond we waved at our small gallery, the tour guide laughing at what great shots we had just hit. Iâ€™d love to tell you that we both brushed our birdie putts in with ease, but Davidâ€™s putt broke across the hole, and he had to settle for par. I made my putt and walked to the 18th with a one shot lead. If the 17th is a tough hole, the 18th is the double bogey on the cake. This is especially true if there is a tournament (or in our case, something much more important, on the line). It is 462 yards of terror; a slight dogleg left with water screaming down the entire inside of the hole with wood planks built into the side of the lake making it seem like the water and the fairway are on the exact same level, one blending seamlessly into the other. Thanks to my birdie on 17 I was first to take the tee. I aimed at the small sliver of fairway and took an aggressive cut at the ball. But half way on my downswing I flinched slightly, my subconscious wandering towards the trouble on the left, and I bailed it out just into the right rough. David, who had been struggling with his driver, decided to unleash his best of the day, a 300 yard bomb down the middle. I was going to have my work cut out for me to win this one. My ball had come to rest just behind a very small and thin tree that guards the right rough where many balls, trying desperately to avoid the water, end up. If I was to get to the green I was going to have to start the ball towards the water, and cut it back ten or fifteen yards to the middle of the green where the pin was cut, just on top of a tier. I chose a 5 iron and opened the face, taking an aggressive swing. The ball started left and started to fade and for a moment I thought it was perfect, but the wind, off the left again, pushed it a little too far and the ball came up just short and right of the green. David stepped up and flushed a 7 iron to fifteen feet behind the hole, now the pressure was squarely on me. Watching golf on TV does a couple of things to the observer. One of the things it does is flatten out lumps and bumps. I can attest to this because the slope that runs through the middle of the 18th green at Sawgrass is much, much larger than it looks on TV, and I had to hit a chip that would have to tip-toe across the top of the slope, being careful not to trip and fall which would send the ball falling to the bottom tier of the green. I selected a 54 degree wedge and pitched the ball onto the top of the slope. It ran down towards the hole but slowed up quickly, like it had pulled a hamstring on the final straight, and settled 3 feet short, leaving me a tricky downhill putt for par. David, still one shot behind, looked over his putt like it was the last he would ever hit and poured it in the middle of the cup for a birdie. He pumped his fist and looked at me with a grin that suggested he had just stolen the last cookie from the pantry. The ball was in my court. But with the near perfect greens it was going to be a hard putt to miss, and I got up and stroked it confidently, the ball hitting the back of the cup and bouncing slightly into the air before settling at the bottom. It was a gentlemanâ€™s half, as we call it in strange countries over the seas, and we were happy with that. That was until Matt came to greet us as we drove towards the clubhouse. â€œHowâ€™d it go guys?â€ he asked. â€œAwesome, wonderful, fantastic.â€ we replied. â€œNine hole playoff?â€ I asked Dave. â€œLetâ€™s do it.â€ he said. We thanked Matt and drove off towards the 10th tee again for a rematch with the back nine at Sawgrass. VJ could wait, heâ€˜d probably be there a while anyway. Great fun . It seemed as if I was there too. 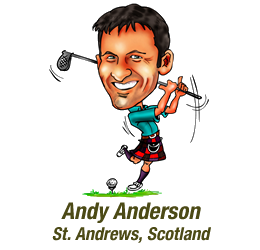 Andy, This may chuff you up a bit but I gotta say your A Day In The Life was more interesting than some of the Tournaments I’ve seen lately. Tks for the up lift . That was an entertaining story. And nice golf! Sincere straight talking, typical aussie, made me feel like I was walking around with them. Highly enjoyable as I don’t normally read long blogs but this was really cool. For those interested, check out the Jan/Feb issue of Cigar Aficionado magazine for a full feature on life on the mini tours by the author. Thanks. Absolutely brilliant rendition of the event. Could picture it in my mind. thoroughly enjoyed the story of their play – was entertaining and down to earth! Ordinarily I don’t read ‘play by play’ stories but this one grabbed my attention from the get-go. Very well written! I’m a 14 handicapper but to play golf at yours (& the pro’s) level would be a whole ‘nother world to me. The part that interested me was when you talked about what the subconscious can do when one is faced with a critical shot, as on the 18th. In other words, confidence and positive thoughts go an extremely long way toward a great game! great read! playing on the Golf Channel Amatuer we get opportunities to play some of the more famous courses. Fellow competitors had the opportunity this summer to play that course and they still rave about it.. call me next time you go I’d love to enjoy the experience with you! I look forward to your next memorable read! What a coincidence. That’s exactly how I played those holes. A most enjoyable recounting of a great front 9…thank-you. I do have one suggestion though, Andy, at the end of your email, may I suggest a nicer picture than the one of your mug. Perhaps a pretty girl, or a nice round golf ball, you know, something with appeal. I must admit I am a Golf addict…nothing wrong with that is there??? Excellent and very exciting story. You guys must be really good to do that! I enjoyed your entertaining account about Sawgrass. I particularly enjoyed your article because I had the wonderful experience of being a volunteer Marshall at The Players this year. My wife was on hole 4 and I was on number 17. I was close to all the big name players and it was most interesting to see how differently they interacted with the crowd. Some were great and acknowledge support and cheers and others were like Reteif Goosen, deadpan no reaction. Great story!! Love the detailed round. Keep these stories coming. most enjoyable read. as for tpc a public course asking for $400 a pop, which is why only two golfers were playing that monday morning, is a shame. I could only dream of playing a course like TPC Sawgrass. A very fun story! Loved it! Some day somehow I will have to find a way to get on that back nine and play those last three finishing holes. What a heart pounding experience it would be!!! Brilliant, just loved it. I actually pictured myself being there,I love that tournament and your desciption of your match was top shelf.You gave the bus load of tourist something they wont forget watching your tee shots on the 17th. Vijay, well I would do the 9 holes again who would’nt, no disrespect to the great man. Loved it ! Just like being out there. Will add a new dimension next time Sawgrass is on TV. Awesome Blog, what a story and what a finish, for you to birdie 17 and Dave 18 is some golf, congrats, you made the most of an amazing golf course. Keep on writing, Augusta Next?? Paying $400 to play a round there is way beyond me but it’s a lovely course which I get to see on the telly. Thanks for the post – it’s a wonderful sharing. Nick,that was great reading! It makes me want to take a golf vacation. Now my bloods circulating.Thanks! Great article! If you don’t make it on the tour you certainly have a future as a writer! Good luck for both. 😀 What a great experience! Hope my son gets to do the same one day. Really enjoyed the article. There are practise facilities at golf courses????? Andy Brown just introduced me to your blog. Well Done!!!! Your writing is excellent and brings me right back to Tour days. Inspiring, really — thoughts for my own blog http://www.changingyourgrip.com (Stories & Lessons of a Former PGA Tour Wife). We spent many late afternoons & early evenings with our boys fishing at 18, too. You’re right, having the course to yourself is magical. A great read, as you say, tv views of the greens differ so much from actually being there, which brings home the skill levels required to compete on courses like these. Well done, keep it up. Nick thanks for a great read, very engaging. we have similar tension with our matches at Charlestown GC. Looking forward to reading more and I will pass this onto my mates to enjoy. Good tale and would love to play there.I think I would have gone and had a look at VJ though.Have played the course 100`s of time`s on x box and best score is 58 on pro setting.Love the way they update the layout each year on x box. :wink:Great blog so well written I was with you all the way. Keep it up. What a thrill for you! Did you win in the “playoff”? I have some of these great golf courses on my Microsoft Golf programs and that will be the closest I ever get to playing them. The $400 is a stumbling block also! My game doesn’t justify paying that much money to play a round! Enjoyed reading your detailed round at Sawgrass! Hi. Thanks for the Sawgrass article. It is probably the most entertaining item I have read for years. Owen Barnes, London. Great blog, very enjoyable read. As a fifty three year old struggling with an eighteen handicap, who’s son now hits longer and straighter than me. I still felt a certain empathy with the two of them, though there is a huge chasm between us in terms of golfing skill and Augusta, and myself and Abbey Hill GC in the south of England where tomorrow I’ll be playing in a society golf day, I hope some of the magic of the article rubs off on to me, thanks.